Abloh’s latest menswear collection attempts to subvert middle-class malaise, but instead showcases the fashion industry’s obsession with ceaseless borrowing from other cultures and social classes. On the ground floor of the Centre Pompidou in the middle of Paris, a room is swatched with reds and blacks, evoking sexuality in a decidedly industrial space. A gaggle of photographers struggle for space, at least thirty of them pinned behind a velvet rope into a spot the size of a toilet stall. Assistants—men and women, in their early- to mid-twenties, wearing black, ankle-length doctor’s coats with white lettering on the back: Off White™ “Staff Uniform”© 2013-20XX—corral them. A few of the photographers bounce on their heels, make impassioned arm gestures when late guests threaten to block their shots of the incoming models. Hurriedly, the assistants seat the final stragglers. A heavy bass reverberates through the central speaker. Then: a booming recording of the poet Charles Bukowski speaking. The first models can be seen in the corridor. Necks crane. There’s a sense you’ve already been here. 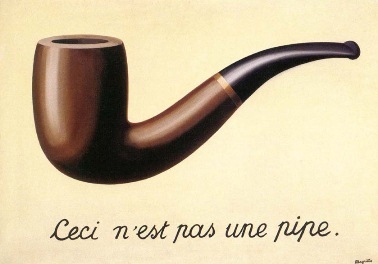 If you’ve looked at a certain René Magritte painting before, if you’ve read any analysis by Marcel Duchamp, you already know what Abloh is thinking. His Off White shoe collaboration with Nike has shoelaces with “SHOELACE” written on them in Helvetica. He calls it “ironic detachment.” Duchamp is “my lawyer,” he also says. The Dadaist, he adds, gives him the grounds to copy and paste, to take and to re-apply. With his new menswear collection, shown on Wednesday morning, Abloh has again angled for detachment but also for social nostalgia. The clothes tell the story of a middle-class life—that which Bukowski rejects in the recording, that which Abloh, who was raised in the suburbs of Rockford, Illinois, rejected. But does the show convey a cut-and-dry subversion, or an exploitative reappropriation? The rumpled button-ups, mismatched ensembles, and the aesthetic of imperfect hand-me-downs found in Goodwills have been placed on Abloh’s high-flouting runway, and as the ten-minute show comes to a close, you realize you have watched nothing less than the co-opting of a social class: a utilitarian middle- and working-class aesthetic that, in Abloh’s attempt to subvert it, he has made all the duller, morphing a varied class aesthetic into the streamlined visual and economic register of the fashion elite. Abloh would call all of this art, a Duchampian copy-and-paste. And although Gvasalia and Uggs are guilty of a similar aesthetic laziness, ever since his rise to mega-designer and collaborator, Abloh has been fashion’s Charon, ferrying the industry between so-called streetwear and high fashion. His decision to play into this appropriation—to champion it, in fact—perhaps holds the most gravity, as he lives up to his given poetic name, guiding us through this current hell. Read the rest of this essay at Garage. Image via Footwear News. Shot by Andrew Boyle. This was a great post. I will be posting my thoughts on Virgil Abloh by next Tuesday 5/22/2018 stay tuned.